If God can use a talking donkey, He can use anything. A few days ago, I bought this book, The Accidental Entrepreneur, by Janine Allis. She is the founder of Boost Juice. 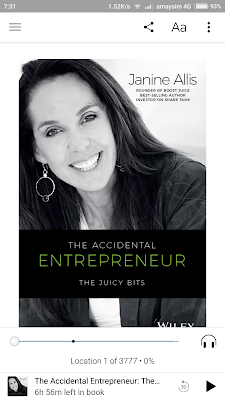 She said her secret to her success in business was having married well, and the right partner, her husband, Jeff Allis. I have always known this from watching my own parents, but reading this cemented this understanding and knowledge in my mind. So this is one more criteria I am adding in looking for a husband. Someone who will support my dreams, and complement my strength and weaknesses, and is a team player. My gym membership problem solved!